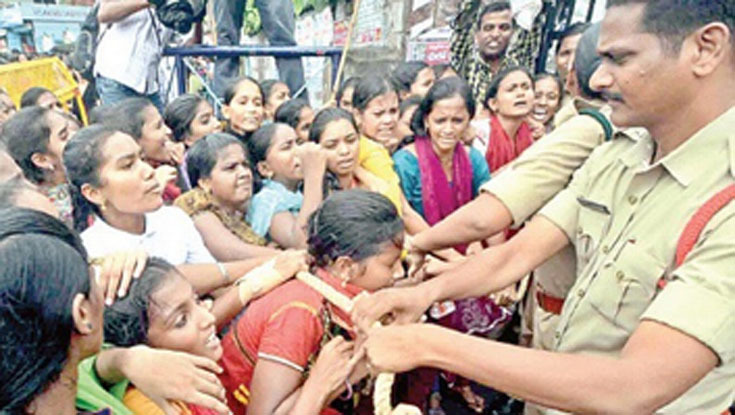 THE brutal attack on students, including girls, in Visakhapatnam on September 15 is a desperate attempt on part of the Chandrababu Naidu-led Andhra Pradesh government to muzzle the voice of those who oppose its policies. Ever since coming to power, Chandrababu has repeatedly showed contempt towards public education. The problems of social welfare hostels are not being addressed in the state for many months. Girl students are facing acute problems due to non-availability of toilets, drinking water facility and permanent buildings in majority of welfare hostels. There is no proper infrastructure, and hardly any maintenance. The SFI Andhra Pradesh state committee had given a call for 'Cycle Jatha' across the state to highlight the deplorable state of welfare hostels. Responding to the call, the Vizag district unit of SFI organised 'Cycle Jatha' throughout the district. But there was no response or action from the government. Then the SFI Vizag City committee led a students' march on September 15 from Saraswathi Park to the collectorate building demanding immediate solution to the issues of welfare hostels and colleges. Thousands of students participated in the march and gathered in front of the collectorate building, despite heavy downpour. AIDWA state secretary D Ramadevi addressed the gathering. After the programme, when a student delegation went to submit a memorandum to the authorities police stopped them. The students demanded that at least an official come out and accept the memorandum. The police were highly provocative from the very beginning and brutal suppression was unleashed on the agitating students. In the melee, hundreds of students barged into the gates of the collectorate building. Police lathicharged hundreds of students, including girls, indiscriminately, injuring many of them. Ten students sustained serious injuries. The students were dragged into police vans and forcefully taken to 1, 2, 3 police stations of Vizag as well as to Bhimunipatnam police station. More than 500 students were arrested. CPI(M) state secretary P Madhu and MLC (PDF) M V S Sarma met the injured students, and submitted a memorandum to the Vizag police commissioner demanding strict action against police personnel for the indiscriminate lathicharge on students. Madhu warned the Chandrababu government against intensified agitation if it continued to ignore the problems of welfare hostels and browbeat the students with an iron hand. A total bandh of educational institutions in Vizag was observed the next day in response to the dastardly attack on students.The Left and progressive sections of society condemned the high handed approach of the state administration and the police towards students. THE Chandrababu Naidu-led government has been making hectic moves for creating a land bank of 15 lakh acres,forcibly acquiring land from small tillers and farmers. As per media reports, already 6,80,544 acres have been identified and the process of acquisition is underway. Unmindful of the resistance by farmers and small tillers to forcible land acquisition, the Chandrababu government is bulldozing any opposition to the move. To take on the government and force it to abandon its land grab spree, a delegation of Left parties visited several villages in Vijayanagaram and Srikhakulam districts where forcible land acquisition is taking place. Left leaders addressed a public meeting at Gedepu Valasa in Vijayanagaram district, where land is being acquired for Bhogavarapu airport. Despite heavy rain, around 2,000 people, mainly women, attended the meeting and ventilated their grievances. P Madhu of CPI(M), Ramakrishna of CPI, Forward Bloc's Sundar Ramaraju, Haranath of CPI(ML) Liberation, S Govindaraju of SUCI(C), Y Kondayya of CPI(ML) New Democracy, and Nagabhushanam of MCPI-K addressed the gathering and assured the villagers of the Left parties' support to their struggles. The Left leaders questioned the motive of the Chandrababu government in trying to construct 14 airports in the state by taking away land of the poor and vulnerable sections. What is the need for so many airports in a state where infrastructural problems are mounting, they said. Instead of addressing the problems which result in suicides of farmers, the government has been pandering to the interests of corporates and rich sections of society. The Left delegation also visited Polanki in Srikhakulam district, where a 4000-MW thermal power plant is going to be set up by a Japanese company. The government is trying to acquire 2,200 acres of land for the company, by taking away land from small and marginal farmers. A whopping 5,500 acres are being sought to be acquired to establish Bhavanapadu port by taking away land from farmers and fishermen. Notification has already been issued in this regard. The stark reality is that Chennai Port is being established with 587 acres and Kandla Port with 750 acres. The Left leaders highlighted these facts in the public meetings and exhorted the local people to fight back the attempts to acquire land forcibly. These visits have enthused the villagers who were made aware of the nefarious designs of the government in acquiring lands much beyond need. The Left leaders assured the agitating farmers and locals to take up statewide agitation on the issue of forcible acquisition of land in the garb of constructing power plants, ports and airports.